Colby farm sunflower field has gained a ton of popularity the last few years. 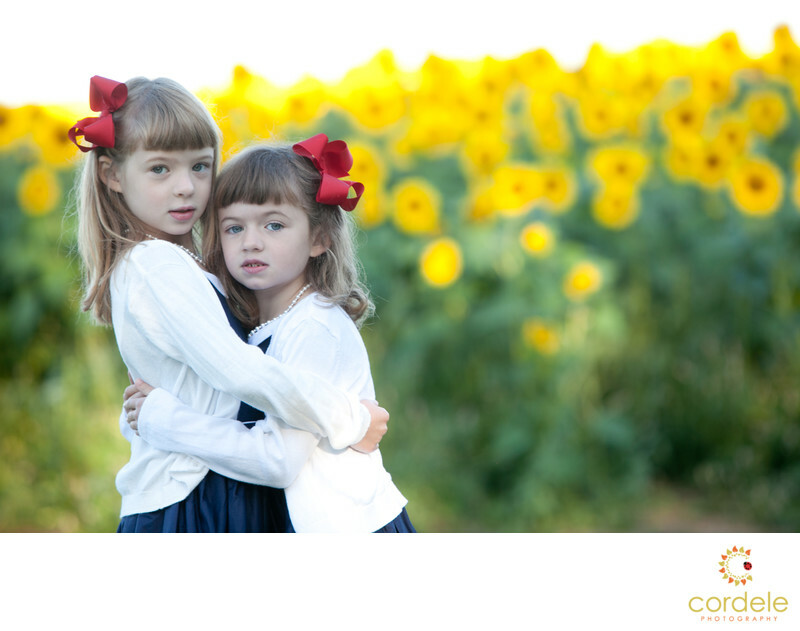 When I was contacted to photograph two sisters in the field, I was so excited. Sunflowers after all are my favorite flower, have you seen my logo. First, I had to go check out what it looked like. Then I came up with a plan to shoot it. The problem is sunflowers follow the sun. I started looking at what other photographers were doing and realized, I had to get up early. Early doesn't work well for me, as I have three small children. We planned to meet there around six forty in the morning and I figured they would be late. With kids, people tend to always run behind, so I add a buffer. We got about 45 minutes of shooting in and I am so glad we got there early. There were SO many photographers there. There were drones flying around, tons of people in the flowers. When I started watching I realized everyone was IN the flowers. I wanted to do something different. I wanted to use my new lens and make the scene about the kids, not the flowers. The flowers were pretty, but the kids were my focus. The mom did an amazing job dressing the kids. When you plan to be up against Yellow flowers, what color do you wear? If you wear black, you look like a bee hive. This mom really did an amazing job with the outfits. The blue dresses with the red bows really made the girls stand out. I was really happy with how the entire shoot turned out. When I look at photos from this day no one else has photos that look like these. They are really unique. Everyone else is IN the flowers and to stand back and use them as the backdrop was my best idea ever. Location: Colby Farm, Newburyport Massachusetts.